You may not recognise Saul Bass by name but you’ll certainly recognise his work. The American graphic designer and Academy Award winning filmmaker is the talent behind many iconic film posters and is considered by many, to be one of the most important designers of the Twentieth Century. During his 40-year career, Bass worked for some of Hollywood’s most prominent filmmakers, including Alfred Hitchcock, Otto Preminger, Billy Wilder and Stanley Kubrick. His emblematic movie posters transformed the visuals of film advertising by using minimalistic, symbolic designs and distinctive typography to visually communicate key elements of the film. Before this, movie posters were dominated by depictions of key scenes or characters from the film, often both juxtaposed with each other. His landmark designs for films including Alfred Hitchcock’s VERTIGO and Otto Preminger’s THE MAN WITH THE GOLDEN ARM became some of the most iconic film posters of the American-postwar era. For the first time ever, Laurence King Publishing has released the first ever collection of film posters by the iconic American graphic designer. SAUL BASS: 20 ICONIC FILM POSTERS by Jennifer Bass and Pat Kirkham brings together a collection of Bass’ most iconic work, including his classic designs for film such as VERTIGO and THE MAGNIFICENT SEVEN to SPARTACUS and THE SHINING. The 44-page book features 20 iconic film posters designed by Bass, documenting his work from 1955 to 1993. A short description about each poster as well as details regarding the film itself is also printed on the reverse, explaining Bass’ inspiration behind the artwork. One of Bass’ most prolific designs, the poster artwork for THE MAN WITH THE GOLDEN ARM , is the first piece of artwork in the book and also doubles as the book’s front cover. The 1955 film about an aspiring jazz drummer who slides back into a drug habit, shows a black, distorted jagged arm with off-kilter typography to starkly communicate the protagonist’s struggle with heroin addiction. Similar bold designs can be seen on the posters for SAINT JOAN (1957) and SPARTACUS (1960) , with Bass using bold and expressive colour palettes as well as finely honed lettering and typography to great effect. Perhaps the most iconic poster design of Bass’ career is his artwork for Alfred Hitchcock’s 1958 film VERTIGO. Its stylized figures of a man and woman being sucked down into a spiral vortex, captures the anxiety and disorientation which is central to the film. The same can also be said for Bass’ poster for ANATOMY OF A MURDER (1959) which features a silhouette of a corpse jarringly dissected into seven pieces, making both a pun on the film’s title and the dissection of a body of evidence in a court of law. Bass’ last commissioned film poster was for Steven Spielberg’s SCHINDLER’S LIST (1993) although it was never distributed. Spielberg greatly admired Bass and in homage, invited him to design a poster for the 1993 film which tells the story about a Polish-based German businessman who saved the lives of over a thousand Jews during World War II. The highly evocative image shows a dark red, thick barbed wire with vicious spikes dominating the design, symbolizing both the death camps and the monstrous evil of Nazism itself. There is no doubt that Bass was a great American designers. His diverse poster work which spanned five decades, has inspired numerous artists and designers, including the cover art for The White Stripes’ single THE HARDEST BUTTON TO BUTTON which is said to be inspired by Bass’ poster for THE MAN WITH THE GOLDEN ARM. 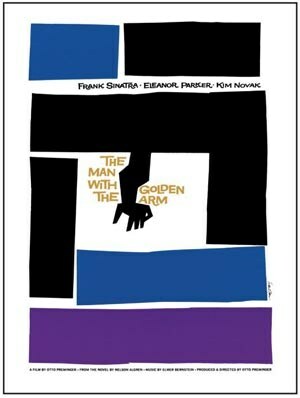 But what makes SAUL BASS: 20 ICONIC FILM POSTERS truly special to other film poster books on the market is that each poster removable. Each piece of artwork is designed to fit 12×16” frame and represents Bass’ work in its original form, before it was alerted by the film studios. 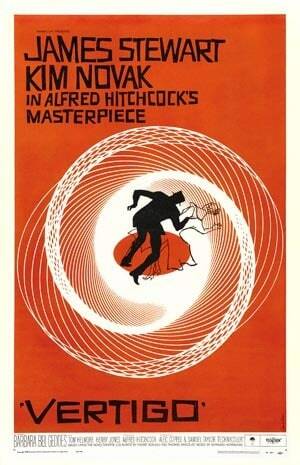 If you’re a fan of film artwork or graphic design, you’re sure to enjoy SAUL BASS: 20 ICONIC FILM POSTERS. A fascinating tribute to a true Mad Men style designer and one of the founding fathers of graphic design.